Car and Diner | BRUCE WHO? CAR and DINER is published and edited by award-winning author/photographer Bruce Hunt. Bruce has authored ten books on Florida travel and history, plus a novel, and has written and photographed numerous articles for magazines and newspapers over the last two decades. He spent five years as a regular feature writer and photographer for DuPont Registry Tampa Bay Magazine. His work has also appeared in the St. Petersburg Times (Tampa Bay Times), Tampa Tribune, Backpacker Magazine, Rock & Ice Magazine, Skydiving Magazine, Coastal Living Magazine, and Celebrity Car Magazine, among others. He also writes the Visiting Small Town Florida and Seafood Lover’s Florida blogs and operates Bruce Hunt Images, a publishing-industry-focused stock photo resource with over 1200 of his best images. Bruce’s latest book Seafood Lover’s Florida (Globe Pequot Press) released in October 2016. Outside of his interests in travel and history writing and photography, Bruce has a bit of a sweet tooth for adventure. He skydived for 30 years, made more than 4500 skydives, and for a while did consulting work as a high-performance parachute designer and prototype tester for a major parachute manufacturer. He dabbled in BASE jumping too—he was the 54th person to jump from the New River Gorge Bridge, in West Virginia, and the 101st person to jump off the world’s tallest waterfall—Angel Falls in Venezuela. 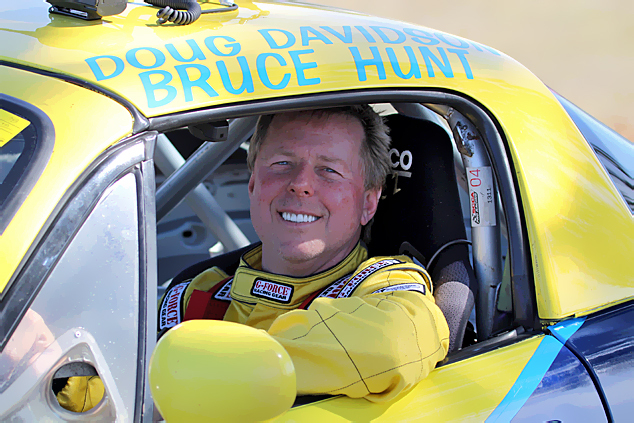 In addition, he and co-driver Doug Davidson race their Mazda Miata in SCCA endurance road racing competitions (and have brought home a few trophies!). Other adventurous endeavors include scuba diving, kayaking, and paragliding.